In this lesson we’ll take a closer look at the Acceptability criterion (RRAR). Acceptability, as you know, is a measure of whether we should accept, reject, or demand further support for an individual premise. However, before we even begin to engage in evaluating the acceptability of a premise or claim we need to decide who has to provide the supporting evidence: The claimant or the challenger. Once we’ve worked that out, there are several criteria we can apply to determine whether we should accept, reject, or demand further support. To argue or not to argue: that is the question. When someone makes a claim, burden of proof determines whether the arguer or the opponent must provide an argument. Burden of proof refers to the obligation of either arguer or challenger to provide further support for their primary claim (or its negation). How do we figure out who bears the burden of proof? To determine who bears the burden of proof we’ll first need to take a step back. Recall that arguments can be decomposed into premises and conclusion(s). A burden of proof can concern any of the premises or the conclusion, however, let’s first focus on the concept as it applies to conclusions; i.e., main claims. Heuristic 1: Will the intended (specific) audience accept the claim without further support? If yes, then the burden falls on the opponents to the claim. If no, then the burden falls on the arguer. Heuristic 2 (better): Would a universal audience (i.e., a group of reasonable people) accept the claim without further support? This is a much better standard of burden of proof for constructing your own arguments because usually we aren’t trying to convince people who already agree with us on issues, we’re trying to convince a general audience. When we evaluate an argument for burden of proof with the second heuristic we are essentially asking if a claim is something a reasonable person would accept (i.e., universal audience) without further support. If the assertion is reasonable, then the opponent bears the burden of proof to show that we should not accept the assertion. If the assertion is unreasonable, then the arguer bears the burden of proof to show (with further supporting premises) why we ought to accept the particular assertion. A: The moon is made of cheese. B: Huh? No reasonable person believes that. When the arguer’s claim isn’t reasonable, an argument must be made! That is, he’s now going to have to support his conclusion with premises (i.e., reasons and evidence). If, in turn, any of the premises are considered unreasonable, then they too will have to be supported with further premises. That is, he will also bear the burden of proof to support those premises until he arrives at support that the audience does accept. This should remind us of Sidgwick’s insight: Begin your arguments with premises your opponent/audience accepts (if you want to lead them to your conclusion). Now we can return to the formal definition. A burden of proof refers to the party (arguer or challenger) that has the obligation to defend their position. It speaks to reasonableness of an assertion (be it a conclusion or a premise). The person who opposes whatever is considered reasonable bears the burden of proof—that is, it’s up to them to convince the audience (through argument) that the default position is unreasonable or incorrect. Without a supporting argument, we have no good reason to take their point of view seriously. When people deny that the moon landing happened, the burden of proof is on them. They are taking a position against all experts and mountains of testimonial and physical evidence. The burden falls upon them to show why we should reject the reasonable position of thinking people landed on the moon. The reasonable position is that people landed on the moon; to assume otherwise would require (significant) further argument. When people say that the earth is only 6 000 years old, the burden of proof falls upon them. It’s up to them to show why multiple converging lines of evidence are mistaken and why the theories upon which modern geology and biology are founded are incorrect. It’s reasonable to think that virtually all geologists are well-qualified to determine what theories and evidence do or do not apply to to the age of the earth. Accepting a claim that implies that virtually all geologists are wrong requires argument beyond mere assertion. Over time, burdens of proof can shift. What was a reasonable assumption a few hundred years ago might be unreasonable today. We often see this with social assumptions. For example, it wasn’t too long ago that it was reasonable (for men) to assume that women weren’t capable of doing math and science. Someone (back then) assuming the opposite would bear the burden of proof. Today, that burden of proof has shifted. Economics is one area where the burden of proof is shifting. It used to be a common assumption that humans are (classically) rational—always seeking to maximize personal interest along the lines of classical mathematical rules. Behavioral economics, interdisciplinary psycho-economics, and socio-economic theory are starting to show these assumptions are wrong. Giving this mounting empirical evidence, the burden of proof is shifting toward economic models built upon the assumption of (classically) rational agents. 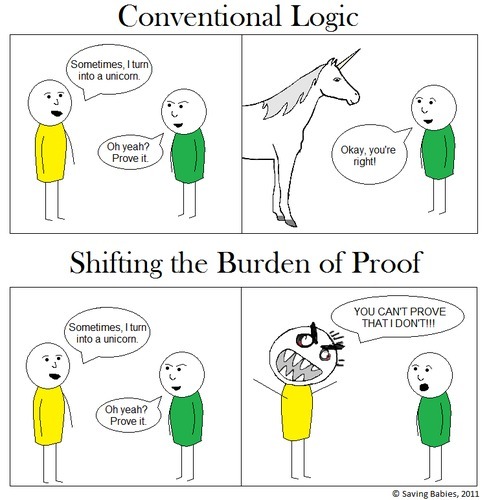 One argument tactic is to inappropriately shift the burden of proof. This often occurs when the burden of proof is shifted onto the person with the reasonable claims. Generally, if your view is a minority/outlier view, the burden of proof is on you. Also, the person making an existential claim (i.e., that something exists) typically must bear the burden of proof because it’s impossible to prove definitively that something doesn’t exist. Conspiracy theorists love this one trick! You’ll often hear them say something like, “Well, you can’t prove that the government DIDN’T know” or “You can’t prove the government ISN’T in on it.” Since it’s impossible to prove a negative, this is inappropriate burden shifting. They’re making a positive claim about what X knew or did. They need to provide positive evidence for their claim. Climate change deniers also love this trick. Despite the overwhelming scientific evidence and consensus for anthropogenic climate change, denialists will rarely take on the burden of proof. They rarely provide positive evidence for their view and instead just point to uncertainty in climate models. Taking on the burden of proof would require them to explain away the thousands of measurements that show the earth’s average temperature is warming. When constructing a strong argument, try keep the burden of proof on your opponent. Hai-ya! Truth is a really complicated concept in philosophy. Also truth is binary–claims are either true or false. Because truth is a difficult concept, in this course we’ll use the notion premise acceptability. Broadly speaking, a premise is acceptable if a universal audience would accept it without further evidence. However, if an argument is for a particular audiences we’ll want to tailor our evaluation of acceptability to that audience but without violating the universal audience standard. (2) Are the claims acceptable to a “reasonable” universal audience. (3) Would these claims be accepted without anyone in the intended or universal audience asking for more evidence/support? If the answer is “yes” to both, then the premise is acceptable. If not then it isn’t, and the burden to provide further support for that claim rests upon the person making the argument. An acceptable premise is one that (a) passes both the intended audience and the reasonable universal audience test and (b) doesn’t have any obvious information contradicting it. (c) the wording of a premise is too vague to evaluate. When you say a premise is “questionable” you need to also include in your evaluation what sort of evidence/additional support the arguer would have to provide for their premise to be true. Then google it! Suppose I want to claim that it’s an affront to the Olympic spirit that wrestling be removed from the Olympics. We might point out that the phrase “affront the the Olympic spirit” is quite vague and could be variously interpreted. When evaluating the premise’s acceptability we might say that the claim is questionable because its meaning is vague. However, at this point we wouldn’t yet be able to say that claim is unacceptable. An unacceptable claim is one for which there is known evidence that directly contradicts the claim. Since, in the wrestling case there isn’t obvious evidence against the claim (because we’re not quite sure exactly what it means), it is not unacceptable, merely questionable. From the context of the argument we might apply the principle of charity and try to ascribe a reasonable meaning to the phrase. (P1) Giving people food stamps removes the incentive to find work and leads to chronic unemployment. (C) Therefore, we should restrict or defund the Food Stamp program. (P1) on its face seems intuitively plausible. If people are just going to be handed something, why work? However, we aren’t sure if this is really true so we say the premise is questionable. Since we’ve said it’s questionable we need to also specify what sort of evidence or support would be needed for it to be acceptable. This might be government data on un/employment rates of people on food stamps that shows people on food stamps have high unemployment rates and continue to be unemployed longer than unemployed people not on food stamps. It turns out that children, the elderly and disabled—i.e., people who we don’t normally expect to fully participate in the workforce—account for 84% of SNAP recipients. Also, contrary to what the premise needs for support, 58% and 62% of SNAP households with an able-bodied adult work (no children/children) and 82% and 87% are employed within a year. This data doesn’t give the premise the required support and there’s evidence that contracts it so we say it is unacceptable. Since the premise is unacceptable, this particular line of argument against the Food Stamp program fails. To summarize: The difference between a questionable and an unacceptable claim is that with the former, it fails the reasonableness test because we don’t have enough information (maybe it’s too vague or we don’t know enough about the topic); and with the latter there is known evidence that contracts the claim that a reasonable audience would be aware of. The Nitty Gritty: How Do We Know What a Reasonable Audience Will Accept? You can’t argue with that. For definitions, the litmus test is what a community of language-users would accept as a definition for a term. If I use a word completely differently than everyone else, my usage is unacceptable because it doesn’t conform with standard use. A thing cannot both exist and not exist at the same time. A statement can’t both be true and false at the same time. If assertion is true then its negation cannot also be true. Self-evident claims can also pertain to the moral realm (unless your audience is philosophers!). Statements like, causing unnecessary suffering is bad” or “killing innocent people is bad” are considered self-evidently true to a reasonable general audience. Unless we are provided with some reason not to, we accept people’s testimony about what happened to them or what they observed. If someone said “it was sunny outside yesterday,” you have no reason not to accept the claim. Also, if I told you that I was going to the store to get myself a cold pop, you should accept my claim at face value. Of course, if I have a reputation of being a big fat liar, then you’d have reason to be skeptical of my claims. Also, if what I said happened to contradict something else I’d said, then you would also have reason to question the acceptability of my claim. But barring such situations, we take speaker observations and testimony at face value until or unless we have reason not to. Although we said that acceptability depends largely on what a reasonable member of a universal audience would accept, there are exceptions. Concerning factual claims, if the intended audience has specialized knowledge (doctors, scientists, etc…) then it’s OK to evaluate the claim in relation to the knowledge base we’d expect that group to have. What happens if the knowledge isn’t possessed by every member of that audience? In such cases, we can make assumptions about what factual knowledge we’d reasonably expect the members of a specific expert audience to have. In all this talk of specific audiences, let’s not lose sight of the “common knowledge by a universal audience” aspect of this criteria. Just because some knowledge might be particular to a field of study or expertise, it doesn’t mean that there isn’t knowledge that we can reasonably expect Joe Schmo to know. Stuff like, “the third Batman movie was awful” or “grass is green” or “Las Vegas is the entertainment capitol of the world” are all things that we’d expect a general (North American) audience to know and so we can accept them at face value. In Mill’s proof of utilitarianism he makes the claim that the general happiness is the supreme good that all humans desire. On its face this isn’t not a claim that we’d expect a universal audience to accept. However, Mill, knowing what a general audience might not accept, provides a supporting argument: Since we all desire our own happiness, it follows that we desire the aggregate of our happiness. When evaluating for premise acceptability, we can do the same with any claim/premise. It it doesn’t seem reasonable we can see if it is supported by a sub-argument/premise. If it is, and that sub-argument is reasonable, then we can accept the claim/premise. If the sub-argument isn’t reasonable then we reject the claim that it supports as well. We can broadly divide this criteria into two types: Uncontroversial claims made by an arguer and claims made by an expert. In the first class these are claims about relatively uncontroversial things that the arguer might know about. For example, I might say that the University of Houston has a good philosophy graduate program. Because I’ve been there and you haven’t, you have no grounds to doubt my claim. So long as you have no reason to doubt me, my claim is acceptable. In the second class we have claims made by experts. This is known as an “appeal to authority.” This is when the arguer supports a claim by appealing to the expert knowledge of a person, institution, or group. It’s important that the expert is an expert in the topic of the claim. For example, arguing that climate change is false because of famous physicist said so is an illegitimate appeal to authority. If a claim is about climate change, a legitimate appeal to authority would appeal to the views of a climate expert. Just like we wouldn’t ask a climate scientist about particle physics, it doesn’t make sense to ask a physicist about the climate. A common tactic of science denialists, conspiracy theorists, and pseudoscientists is to appeal to experts that aren’t experts in the topic at hand. A Note on Appeals to Authority: The best appeals to authority are appeals to a consensus position of a community of experts. Appeal to a single expert doesn’t carry much weight, especially in controversial topics. The opinion could easily be an outlier. Also, not all expert’s views carry equal weight. The views of a community college instructor don’t carry the same weight as those of a famous Harvard professor in the same field. We might label a claim as unacceptable because it is inconsistent with other claims the same arguer has made. For example, in alt-med we often see arguments stating that the flu vaccine shouldn’t be used because its efficacy can sometimes be as low as 45%. However, the northern Andean magic rainbow-berry or acupuncture they propose instead has no reported efficacy. So, if the argument is that we should reject a treatment because of low efficacy, the same should apply to their own conclusion. We also hear that we shouldn’t take manufactured (i.e., “unnatural) drugs because Big-Pharma’s just trying to sell you stuff to make money, then in the same breath the same website or person will try to sell you the latest all-natural miracle cure…and not for free either! To be sure, inconsistency doesn’t mean the conclusion is false, it only means that the argument for the conclusion is poor and we need to either reject the premise(s) or the conclusion (or both) because both can’t be true. Sometimes people can hold the right views (conclusions) for the wrong reasons or as a matter of dumb luck, not because they arrived at them through good argument. The current use of “begging the question” meaning “raises the question” is something that irks philosophers to no end. The original (and TRUE!) meaning of the phrase is “circular reasoning.” In other words, in your argument, you assume to be true the very thing you are trying to prove. How do you know what’s in the Bible is true? ‘Cuz it’s the word of God. How do you know it’s the word of God? ‘Cuz it says so in the Bible. Notice that for the argument to work you have to assume the very thing the arguer tries to prove: that the contents of the Bible are true. We can call a premise unacceptable if it has one or more of the language problems we encountered on the section on definitions. In other words, if the language of the premise is overly vague or suffers from semantic and/or syntactic ambiguity, we might say it’s unacceptable (if context can’t reasonably sort it out). Suppose I claim that “I’ve never been seriously sick since I started taking Tibetan Booga-Booga Bush capsules.” We can’t accept this claim because “seriously sick” is too vague. For how long and for what intensity do I have to be sick to be “seriously sick”. Do I need to be hospitalized or just miss work? Or maybe just miss my work out. It’s not clear from the phrase so we’d say the premise is questionable or unacceptable depending on the severity of the vagueness. A. Burden of proof: Who bears the burden of proof? The claim-maker or the challenger? Explain your answer. 1. The moon is made of cheese. 2. Bowling Green has a university. 4. Global warming is a hoax. 5. At the end of the 1500s when Galileo declared that the earth revolves around the sun, who bore the burden of proof? Galileo or the Church? 6. It’s wrong to raise dogs for food. 7. It’s wrong to raise pigs for food. 8. Gay marriage should be legal. 9. What is the Fourth Amendment (Links to an external site.)? The Fourth amendment relates to burden of proof because it requires that police demonstrate probable cause in order to stop and search someone. Consider Operation Pipeline’s standards for stopping people you looked at last lesson. Does Operation Pipeline inappropriately remove the burden of proof from government police agencies? What are your thoughts? 10. Returning to the Fourth Amendment. In 1984 the Congress amended the Comprehensive and Drug Abuse Prevention and Control Act to allow local and state police departments to keep 80% of any cash or proceeds from property used drug related activities. So long as a car, house, or whatever was used in a drug transaction, it didn’t matter if the owner was involved or knew of the activity, the property was seized. The law allows for the owner to prove the property’s “innocence.” (a) Upon whom do you think the burden currently rests? (b) Upon whom do you think it should rest? 11. What is the Fourteenth Amendment (Links to an external site.)? Case: Armstrong v. United States, May 1996. In May 1996, Armstrong and his lawyers challenged his sentence for conspiracy to distribute crack cocaine in LA citing that his sentence was unfairly harsh because of his race (i.e., Black). In LA most crack offenders are white. When someone is brought up on drug charges, a prosecutor has discretion whether to assign the case to the state or the federal system. Sentencing for the same crime is much more severe in the Federal system. In a 3 year period, of the 2000 charged with federal (more severe sentence) rather than state (less severe sentence) crack cocaine violations, only 9 weren’t Black. None were white. The Court ruled that unless evidence of “conscious, intentional bias” can be produced by the prosecutor (to the Supreme Court) the Court would not allow any inquiry into the reasons for or causes of apparent racial disparities in prosecutorial decision-making. (a) Do you think this is an appropriate burden of proof? (b) Why/Why not? B. Conditions of Premise Acceptability: Evaluate the premises/claims for acceptability. If you say a premise is acceptable support your position with one of the 5 conditions of premise acceptability (definition/logical truth, supported with a sub-premise, report/eyewitness testimony, common knowledge, authority of expert) . If you say an premise is questionable, give one of the 3 conditions (vague language, you don’t know enough about the issue, you don’t know what a universal audience would think). If a premise is unacceptable. cite of the 3 conditions of unacceptability (circular, internal inconsistency, language is vague without context to clarify). 3. People only act for selfish reasons. Even if they’re helping you it’s because it makes them feel good about themselves or eliminates guilt. 4. GMOs are just as safe for human consumption as conventional crops. Almost every major scientific body in the world agrees. 5. Getting a good job is easy. You can get a good job when you have enough job experience in that job. 6. I know that UFO is an alien space craft since I can’t tell what it is. 7. Lying isn’t always wrong. For example, if lying would save someone’s life then it would be OK to lie. A life can be more valuable than truth sometimes. 8. There are four seasons in the midwest. 10. A heuristic is a rule of thumb. 11. It’s wrong to harm animals unnecessarily. But love spare ribs. 12. All human life is sacred and killing is always wrong. But I’m Ok with the death penalty. 13. Zika virus is a plot by Big Pharma to force people to buy vaccines. You should buy these vitamins instead to protect yourself. 14. Organic is better because it doesn’t use pesticides.